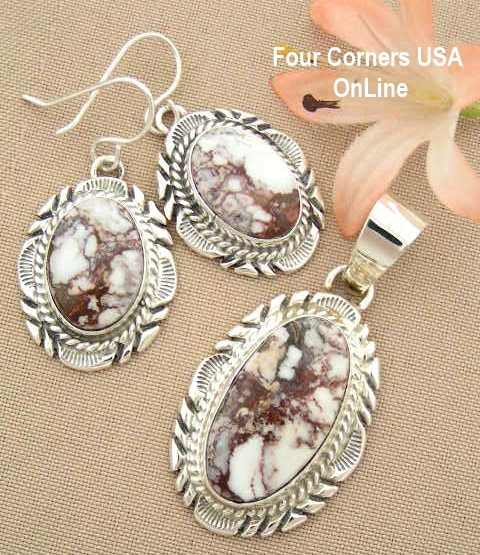 Gorgeous coloring of Crazy Horse Magnesite also referred to as Wild Horse Stone. Although limited selections absolutely gorgeous stone specimens and jewelry creations by Thomas Francisco, Ervin Hoskie Design, Running Bear and Ray Begay. Our Crazy Horse, also known as Wild Horse, is a magnesite mined in the United States (not to be confused with Australian Magnesite which has very different coloring and often used as a base for 'dyed Turquoise). We were first introduced to Crazy Horse Magnesite some 30 years ago when it was mined in the Gila region of New Mexico (rough stone still available in private collections for cutting and jewelry making). At that time when this stone hit the market, rather quietly I must admit, the name was Crazy Horse based likely on the crazy striations in the matrix and varied brown beige coloring similar to Wild Horses. So we still call it Crazy Horse and realize the name has evolved to Wild Horse representing one in the same American stone.